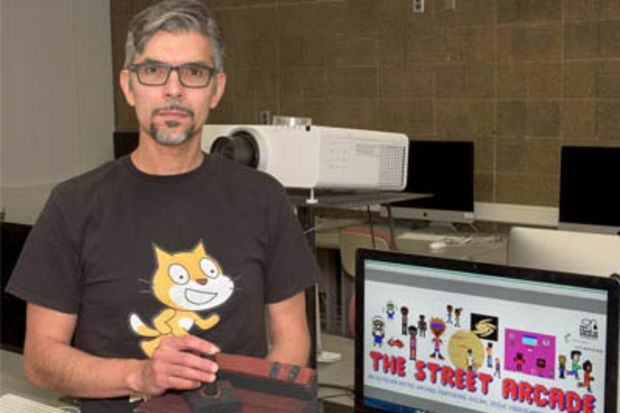 Steve Ciampaglia is the founder of The Plug-In, which introduced the project "Street Arcade. " CHICAGO — Most video games give a glorified picture of war — but two local veterans and two professors want to change that. The Army veterans are creating a series of games to combat the current message of games like "Call of Duty" and "Battlefied." 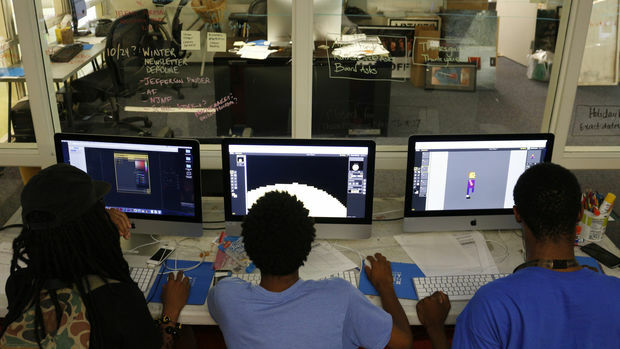 The games are a project of Plug-In Studio, which is a socially conscious new media art collective that collaborates with teens and adults in diverse Chicago communities. It was created by Steve Ciampaglia, an assistant professor of art and design at Northern Illinois University, and Kerry Richardson, an adjunct professor at the School of the Art Institute. A military-focused game is the latest project, but the two most recently worked with 13 African-American teen artists from the South Side on video games that attempted to depict life from the teens' perspectives. The finished product, introduced over the summer at the Hyde Park Art Center, featured several arcade-style consoles with joysticks and buttons installed along the street. During the process of creating the games, the teens were prompted to discuss issues they see and deal with in their communities. From that discussion, they came up with a project called the Street Arcade. The video games addressed social issues such as white privilege, racial profiling, peer pressure and more. The professors hope the games will help players see issues through the teens' eyes. One of the games has players pretend to be rookie police officers on their first day on the job. They are reminded that their job is to serve and protect. The player goes through training. "I am African-American and I see on the news how the police are killing my kind," the teen who made the game wrote in an online description of the game. "It kind of hurts me and I want to just change that to make a better world, for not only my community, but for everybody else." Another game, "Life Choices," reminds players to choose wisely before starting the game. They have two choices in the first scene: hang out with gang members who are drinking and smoking or play basketball. "Let's be honest, teenagers are stupid," another teen posted. "They want to drink and hang with the wrong people. But you could hang with the right people, get a good score on the ACT and have a bright future." The latest project involving the Army veterans is called "The Anti-WarGames Collective: Counter Recruitment Videogames." Plug-In Studio was awarded a 2016 Propeller Fund Grant for the project. Ciampaglia said that in the wake of the 9/11 terrorist attacks, the U.S. military began to heavily recruit Latinos, particularly those from low-income and immigrant communities. He said the military started using video games to recruit. Plug-In Studio’s new project will work with Latino military veterans Eric J. Garcia and Michael Figueroa. They will produce a series of counter-recruitment video games to encourage Latino teens to critique the representation of the military in video games and the military’s use of video games to recruit teens, Ciampaglia said. “Commercial video games such as ‘Call of Duty’ and ‘Battlefield’ focus on the warfare and weaponry so these games are going to be about what it’s really like to be a member of the U.S. military,” he said. The goal is to have this game completed by Veterans Day and then move on to phase two, in which Latino teens will be consulted, Ciampaglia said.